After a long day knowing that you're putting together a quick and easy meal is a great feeling and tonight's dinner couldn't be easier to make! 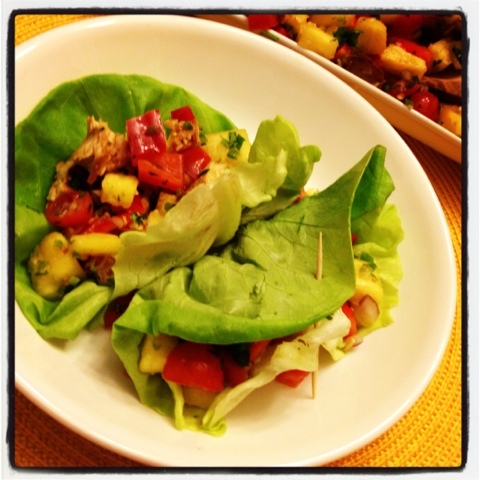 Tonight we are serving up our teriyaki grilled chicken & pineapple salsa lettuce wraps. This is super simple as we take a little help from the store to marinate our chicken. Simply buy a low sodium teriyaki sauce to keep it healthy and be sure to check the calorie counts as many different brands have very different counts. The teriyaki we chose had only 15 calories per tbsp which kept us very happy. Moving on to our delicious salsa... we thought pineapple salsa would be the perfect compliment to our teriyaki sauce and let us just say, we were right! To make your salsa simply chop up pineapple, red onion, red pepper, jalapeno (omit if you don't like spice), cherry tomatoes, garlic, ginger, a handful of fresh cilantro and squeeze in the juice from one lime. Very healthy and very simple... not to mention very delicious. Take a look as these gorgeous colors, this is such a pretty dish and would make for a wonderful appetizer to serve up at any dinner party. But tonight we're turning this into a healthy and delicious meal. 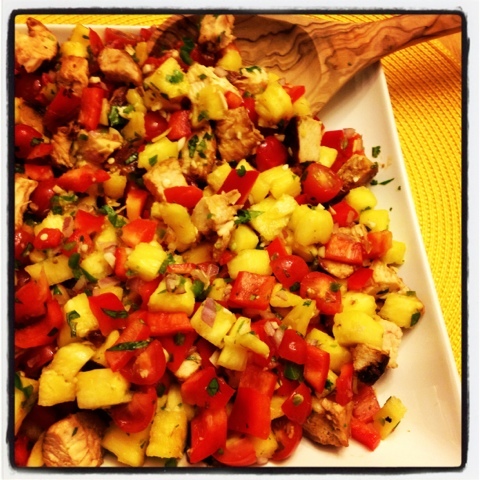 Simply wrap up this teriyaki chicken pineapple salsa into a crisp lettuce leaf and enjoy! Hope you enjoy this one as much as we do!